Markets are continuing their upward streak this morning, continuing to move higher based on the API’s report of a sizable crude draw. Crude prices are currently trading at $57.77, a gain of 21 cents (0.4%) since yesterday’s close. Refined products both tracked higher along with crude yesterday, and are continuing their ascent today. Diesel prices gained 0.8%, while gasoline rose by 1.3%. Today, gasoline is maintaining the lead with gains this morning at 1.6 cents (0.9%), currently trading at $1.7124. Diesel’s growth has been weaker but has managed to pick up 0.6 cents (0.3%). Diesel prices are currently $1.9464. The API released their weekly numbers yesterday, which were slightly more bullish than the market had expected. Crude draws were estimated to be 5.2 million barrels (MMbbls), almost 50% higher than the market expectation. 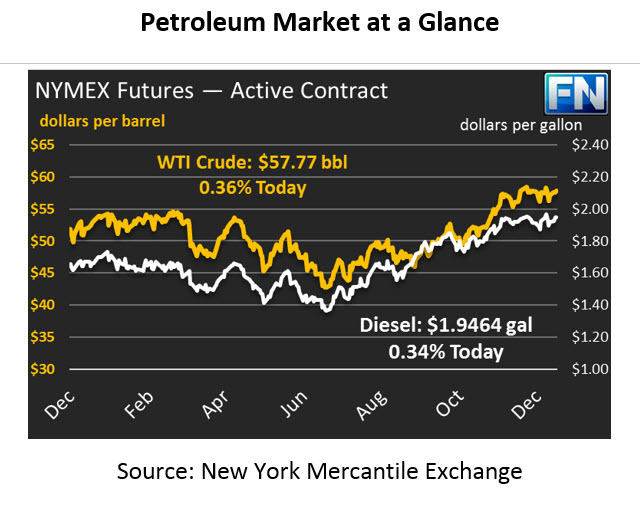 Diesel draws appear to be double what the market had expected. And gasoline was in line with expectations, taking out the threat of a supply build. Of course, last week the API’s numbers appeared supportive of prices as well, but the EIA contradicted their numbers. We’ll see if the same holds true this week. Keystone XL is facing yet another delay to their production. Recall that last month, a spill in the main Keystone line focused some controversy on the approval of the Keystone XL line. Just days after the spill, state regulators approved the pipeline’s construction but required that they take a different route. TransCanada attempted to appeal the decision, but yesterday their appeal was denied. The new route will take more time to scope and plan, and could potentially require new permitting. France announced yesterday that they will be banning all oil production in the country by 2040. France accounts for .02% of world production – just 15 kbpd. The move is being interpreted by markets to be a symbolic activity that won’t significantly impact crude oil trends. It’s easy for countries with extremely low oil production to commit to banning production, but countries with high oil output are quite unlikely to jump on the bandwagon. Quick poll – which U.S. state produces the same amount of crude oil as the nation of France? Read tomorrow’s article for the answer.